Social media dominance has increased dramatically over the past few years with popular social networking sites like Facebook, Instagram, Twitter, Snapchat, etc. leading the race. Social media usage has witnessed an unprecedented growth over the past decade, thanks to Facebook and Instagram which dominate the social media ecosystem. Social media has seen a significant surge in active monthly users in the last two years and looking at the numbers, it’s only increasing with no signs of going back. It’s almost surprising to see how social media has evolved over the past decade. Today, social media dominance has reached such an extent even the remotest parts of the world have knew about Facebook and Instagram, and they are most likely using it every day. Facebook undoubtedly dominates the social media scene in terms of audience reach and engagement, but Instagram is good at making noise too. This article looks at the two popular social media sites and explains how they differ from each other. Facebook has been at the forefront of social networking scene for the past couple of years. Facebook is a California-based social media giant that has evolved from a simple online networking site to a social networking powerhouse. What started out just as a plain website for Harvard students has now become the internet sensation with billions of users worldwide. It has come a long way since its debut in 2004. The first major design overhaul to Facebook was the “News Feed” being added to a user’s homepage along with the “Mini Feed” that started appearing on individual profile pages. In 2011, Facebook ditched the “wall” to introduce its infamous “Timeline”. It was the brainchild of Mark Zuckerberg which has now become the most popular buzzword among the social media community. Facebook took the social media world by storm when it bought the popular photo-sharing application, Instagram in 2012. The acquisition was a game changer for the social media giant who squashed a potential threat to its dominance. Instagram is a popular photo-sharing application which allows users to share pictures onto their profiles. It was an idea to create a one-stop photo-sharing platform that has now become the second-most popular social media platform out there, with over 300 million active users. It was initially launched in 2010 exclusively for the iOS as an image-centric social media platform. The big change happened when Instagram removed its restriction to go non-square. The decision has not only given a major boost to the app but also inspired it to go an extra mile. Today Instagram is a multifaceted platform that has established itself as a popular buzzword among the youths. Instagram has also spurred a revolution in branding and advertising by providing a platform for the most prominent brands to endorse their products. Instagram has moved beyond photography and its biggest upgrade so far came last year with the worldwide availability of Instagram Live – a feature that allows you to broadcast video to your followers in real-time. Facebook is a general social networking website that allows users to create online profiles, share pictures and videos, send messages, and keep in touch with friends, family or colleagues over a common platform. Instagram, on the other hand, is almost like Facebook but it’s more photo-centric with emphasis on photos and videos. It’s more like a photo-sharing application. Despite the common goal, they are two separate social media platforms with different approaches to networking. Facebook is mostly a closed-knit community of people who know each other. For example, you can be group with your graduation buddies, you can be group with your workplace colleagues, you can join your family group, etc. Instagram lets you build and join communities of people who share your common interest such as pets, photography, fashion, movies, technology, travel, etc. Facebook has been around much longer than mostly every social networking platform out there, including Instagram. This makes Facebook clearly a dominant player among the social networking community with a much larger consumer reach and active users. Instagram, although rapidly growing, has relatively lesser user database in terms of consumer reach but it’s quite popular among youths. Facebook is generally targeted at all age groups. 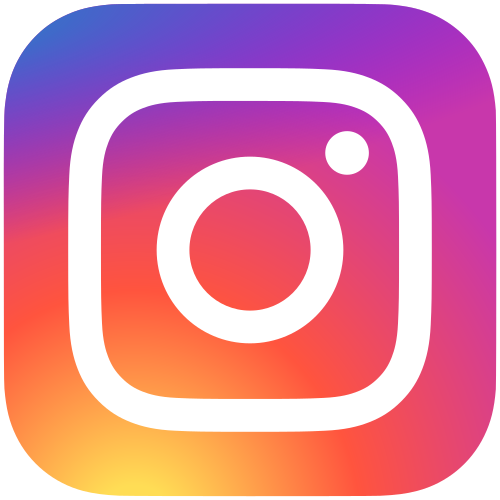 Unlike Facebook, Instagram relies heavily on mobility meaning the landing pages should be hundred percent optimized for mobile users so that advertisers would make the best of their online presence on Instagram. Although roughly a third of Facebook users log in with their phones, still a majority of users prefer mobile websites or web versions of Facebook. However, it’s perfectly optimized for mobile users. Brand awareness is the key to every business which requires you to understand your target audience based on age, gender, interests, etc. Instagram is ideal for business targeting younger demographic, whereas Facebook is great for businesses targeting older generation users who have relatively higher spending. Studies suggest brand awareness with Instagram is much more effective than it does with Facebook. Average engagement per post is higher than Facebook, thanks to all the visually appealing posts. Instagram is surely better at creating brand awareness than Facebook. While both are the two most popular social media platforms out there, they have their fair share of differences on various fronts. Instagram is all about photos and videos; it’s a photo-sharing application. Facebook, on the other hand, is multifaceted which lets you do anything; you can create and join groups, shop, share photos and videos, create an event, and more with Facebook. Instagram is a neat app without much clutter which makes it easy to navigate and work your way around, whereas Facebook, on the other hand, is a multi-purpose application with lots of features which makes it a little hard to process everything that’s going on around Facebook. Sagar Khillar. "Difference Between Facebook and Instagram." DifferenceBetween.net. 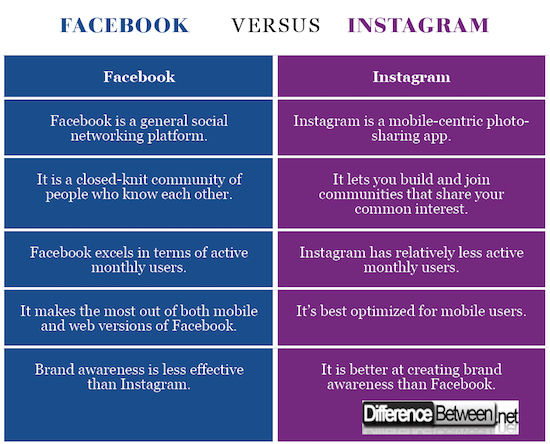 April 5, 2019 < http://www.differencebetween.net/technology/internet/difference-between-facebook-and-instagram/ >.